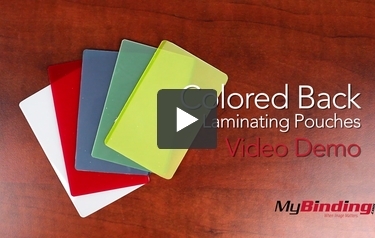 These are Colored Back Laminating Pouches! They have one clear side and one colored side, and the colored side is transparent, and both sides have a glossy finish. To use, insert your project into the pouch. Align it so your margins are even on all sides. These are 10 mil, which means you’ll need a machine that can support that thickness. I didn’t actually have one on hand for this demo, so I tried a 5 mil setting. It did work, but not as well—and I ran them through twice to be safe. Here is the final result, all in a line. And flip them around to see the clear side. You can find colored back pouches in blue, green, red, white, and yellow. And remember, 10 mil pouch laminators. 5 mil ones kind of work, but not that well.